Not to be confused with Sara Chang. Sarah Chang (Korean: 장영주; born Young Joo Chang; December 10, 1980) is an American classical violinist. Recognized as a child prodigy, she first played as a soloist with the New York Philharmonic and the Philadelphia Orchestra in 1989. She enrolled at Juilliard School to study music, graduated in 1999, and continued university studies. Especially during the 1990s and 2000s, Chang had major roles as a soloist with many of the world's major orchestras. Chang was born in Philadelphia, Pennsylvania, and raised in Cherry Hill and Voorhees Township, New Jersey. She is the daughter of Myoung-Jun, a composer, and Min-Soo Chang, who was a violinist and music teacher. Chang's parents moved to the United States from South Korea in 1979 for her father's advanced music degree at Temple University. Her mother took composition classes at the University of Pennsylvania. Chang has said that although she "never actually lived in Korea... I do still feel very strongly it's where my roots are." Her younger brother Michael (born 1987) has a degree from Princeton University. 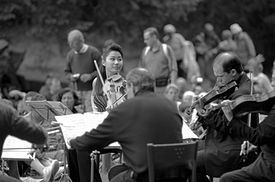 In 1986, when Chang was 5 years old, she auditioned for and was accepted to the Juilliard School by performing the Bruch Violin Concerto No. 1 in G minor. Chang spent her weekends attending music classes at Juilliard and shopping in New York City with her parents. When Chang was 6 years old, she started studying with Isaac Stern outside school. She continuously visits Stern's studio to learn new pieces with him. In 1989, she began working with Dorothy DeLay at her studio in New York where her father had received his musical lessons, and at the Aspen Music Festival and School. A former student and assistant to DeLay, Hyo Kang, also provided training to Chang. Following her 1999 high school graduation in New Jersey, she returned to Juilliard for university and studied with DeLay. Chang learned from a family environment to naturally speak Korean. She is also fluent in German. Due to her musical accomplishments, Chang is among a very small number of professional figures recognized as a child prodigy. Her mother trained her to play one-finger melodies on the piano at age 3. For her fourth birthday, she was given a 1/16-sized violin. At age 8, she auditioned alongside Zubin Mehta and Riccardo Muti, who worked with the New York Philharmonic and the Philadelphia Orchestra. Both granted her immediate engagements. In 1991, when Chang was 10 years old, she recorded her first album, Debut; it was released by EMI Classics on August 18, 1992 and quickly reached the Billboard chart of classical best-sellers. Chang quickly rose to fame and became known on an international scale, performing up to 150 concerts a year. At the age of 17, she asked for a three-month break; this opportunity did not come until she turned 20 years old. In 2006, Newsweek ranked her as one of the Top Eight Achieving Females in the United States. In the interview accompanying the feature, she commented: "I think having a career at such an early age kept me focused. We schedule at least two to three years in advance in the classical industry. I felt so grounded and so grateful to already know what it was that I wanted to do with my life." In 2002, she performed in Pyongyang, North Korea. Chang commented: "The concert was full of government officials. Every single last seat. It was invitation only, but it was an unbelievable experience. Frightening and exhilarating at the same time. And I just thought about how lucky I am. I am so fortunate to be a musician, and at that moment, I genuinely felt that music is the one and only universal language." Chang took part in watchmaker Movado's global advertising campaign "The Art of Time" with Pete Sampras and composer Wynton Marsalis. For the 2004 Olympics, she was selected to carry the Olympic Torch in New York. In 2005, Yale University dedicated a chair in Sprague Hall in Chang's name. Following this, Chang toured for a year with the Berlin Philharmonic and the Royal Concertgebouw Orchestra in a Sextet programme of summer festivals leading to a concert at the Berlin Philharmonie. Chang played a recital at Carnegie Hall on April 7, 2007, accompanied by the British pianist Ashley Wass. She has continued to perform with the Los Angeles Philharmonic and Esa-Pekka Salonen and make appearances with the former at both the Hollywood Bowl and Walt Disney Concert Hall throughout 2008. On March 27 and 28 2008 she played for San Antonio, Texas audiences at the Majestic Theater, a performance which was preceded by an appearance (to meet and inspire young as well as seasoned musicians at no charge) at Antonio Strad Violin in the same city. From May 2009 to June 2010, she held recital tours across Europe, North America and Asia with pianist Andrew von Oeyen; a July 2010 recording of the two was eventually released. In the February 12, 2010 program, she held her recital at the Barbican Hall in London. Chang made an appearance at the University of Southern California in March 2010, where she played Max Bruch's Violin Concerto No. 1 in G minor, Op. 26. She performed at the Hollywood Bowl in August 2010. Sarah Chang owns several violins, and her main violin is the 1717 Guarneri del Gesu by the Cremonese luthier, Giuseppe Guarneri del Gesù which she inherited from her mentor, Isaac Stern. In another interview in 2013, she told the reporter that she bought the violin from Stern, not received it. Chang uses a variety of bows: she has said that she prefers a Pajeot for Mozart and Bach; a Sartory for the Tchaikovsky and Sibelius concerti; and two Dominique Peccattes for other music. Chang has performed with the New York Philharmonic, the Philadelphia Orchestra, the Chicago Symphony, the Boston Symphony, the Cleveland Orchestra, the Montréal Symphony Orchestra, the Berlin Philharmonic, the Vienna Philharmonic, orchestras in London, England, and the Royal Concertgebouw Orchestra of Amsterdam, the Netherlands. Additionally, she has performed with the Los Angeles Philharmonic, the NHK Symphony Orchestra of Tokyo, the Hong Kong Philharmonic Orchestra, the Bayerische Rundfunk Orchestra, the Washington National Symphony Orchestra, the Oslo Philharmonic, the Pittsburgh Symphony Orchestra, the Melbourne Symphony, Orchestre de la Suisse Romande, Orchestre Philharmonique de Luxembourg, the San Francisco Symphony Orchestra, the Orchestre National de France, the Honolulu Symphony, the St. Olaf Orchestra, and the Netherlands Radio Philharmonic Orchestra amongst others. Chang has also been a soloist under the baton of conductors Mariss Jansons, Daniel Barenboim, Sir Colin Davis, Charles Dutoit, Bernard Haitink, James Levine, Lorin Maazel, Kurt Masur, Zubin Mehta, Riccardo Muti, André Previn, Sir Simon Rattle, Wolfgang Sawallisch, Leonard Slatkin, Michael Tilson Thomas, Plácido Domingo, David Lockington, David Zinman, Gustavo Dudamel, Valery Gergiev, Esa-Pekka Salonen, Jaap van Zweden, John Williams, Steven Amundson, and others. Notable recital engagements have included her Carnegie Hall debut and performances at the Kennedy Center, Orchestra Hall, Symphony Hall, Barbican Centre, Philharmonie, and Concertgebouw. As a chamber musician, Chang has collaborated with Pinchas Zukerman, Wolfgang Sawallisch, Vladimir Ashkenazy, Yefim Bronfman, Martha Argerich, Leif Ove Andsnes, Stephen Kovacevich, Yo-Yo Ma, Lynn Harrell, Lars Vogt, and the late Isaac Stern. She has made several chamber recordings with current and former members of the Berlin Philharmonic, including the Sextet and Piano Quintet of Dvořák and the Souvenir de Florence of Tchaikovsky. In January 2011, Sarah Chang was interviewed by Evan Solomon of Power & Politics (CBC) where it was revealed that she had been appointed by President Obama to the Presidential Commission on Russian Relations, and also was taking on a new role as State Department Special Cultural Envoy. Chang has already been promoting and supporting childhood musical education for many years. She has also been a cultural ambassador for the U.S.; for instance, she was invited to play in North Korea's capital, Pyongyang, with a South Korean orchestra in 2002. ^ Avery Fisher Prize rarely grants this distinction. Chang is among one of three females to be selected for the award that year, along with Nadja Salerno-Sonnenberg and Pamela Frank. For more information, The New York Times. ^ To date, Chang is the youngest person on record to receive this title; see this Los Angeles Times article. ^ Earls, Irene. Young Musicians in World History. Greenwood Publishing Group. p. 54. ISBN 978-0-313-31442-1. OCLC 47838282. ^ "Sarah Chang | IMG Artists". imgartists.com. ^ Webster, Daniel. "Sarah Chang Soloist At Mann Concert", The Philadelphia Inquirer, July 7, 1995, backed up by the [[Internet Archive as of March 4, 2016. Accessed January 1, 2018. "Two days before her concert, she was sleeping in, luxuriating in the chance to open her eyes around 10 in the bedroom of her family's Cherry Hill home." ^ Scher, Valerie. "Violinist's key: Just be a minor -| Gifted Sarah Chang still a teen to the core", San Diego Union-Tribune, October 31, 1995. Accessed March 17, 2011. "'I never play anything the same way twice,' she says by phone from her family's home in Voorhees, NJ." ^ "Young, gifted and calling the tunes". The Independent Music. August 12, 1999. Retrieved October 29, 2010. ^ "Sarah Chang is back". Korea JoongAng Daily. September 8, 2010. Retrieved October 30, 2010. 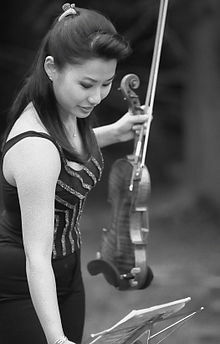 ^ "Violinist.com interview with Sarah Chang". Violinist.com. December 18, 2009. Retrieved October 30, 2010. ^ "Sarah Chang -- Me and My 1717 Guarneri". April 23, 2009. Retrieved October 30, 2010. ^ a b Power & Politics with Evan Solomon, aired on February 21, 2011 (view at 30:00 -> 49:00 of the clip). Retrieved 24 Feb 2011. ^ "Violinist Sarah Chang & Pianist Andrew Von Oeyen Perform at Markham Theatre 2/24". Broadway World. January 23, 2010. Retrieved October 31, 2010. ^ America's Intelligence Wire, May 9, 2004. ^ Dervan, Michael (January 29, 2009). "Living with the 'prodigy' tag". Irish Times. Retrieved January 29, 2009. ^ Oksenhorn, Stewart. "Sarah S=Chang Cherishes Aspen Experience". www.aspentimes.com. ^ "Yale School of Music : Faculty (Hyo Kang, violin)" Archived 2011-01-11 at the Wayback Machine. Yale School of Music. Retrieved October 31, 2010. ^ Woodstra, Chris; Brennan, Scrott (2006). All music guide to classical music: the definitive guide to classical music. Reed Business Information. p. 1607. ISBN 0-87930-865-6. ^ "Noted Violinist Sarah Chang to Perform at UA with Alabama Symphony Orchestra March 14". UA News. February 24, 2004. Retrieved October 30, 2010. ^ "A Violin Prodigy Sees The World". Newsweek. August 9, 1999. Retrieved October 31, 2010. ^ "Twitter Q&A: Sarah Chang" (PDF). Barbican. January 2, 2010. p. 3. Retrieved February 24, 2012. ^ "Sarah Chang Aims to Cast Off Prodigy Label". Korea Times. December 7, 2009. Retrieved October 30, 2010. ^ a b c Reel, James (January 2004). "Interview with Violinist Sarah Chang: Adulthood is offering a new world of opportunities for this former child prodigy". Strings Magazine (115). Retrieved 22 March 2015. ^ Heisler, T (September 15, 2004). Rocky Mountain News, p. 3. ^ "ABOUT THE PERFORMER: Sarah Chang". Hollywood Bowl. Retrieved October 31, 2010. ^ "Sarah Chang, violin" Archived 2011-01-02 at the Wayback Machine. Louisville Orchestra. February 2, 2009. Retrieved October 31, 2010. ^ a b "For me, the stage is my home: violinist Sarah Chang". Colorado KoreanNetwork. kncolorado.com. Retrieved October 31, 2010. ^ a b "Sarah Chang: Playing in Pyongyang" Archived 2010-11-03 at the Wayback Machine. May 11, 2010. Retrieved October 30, 2010. ^ "EMI Classics - Sarah Chang". EMI Classics. Retrieved October 31, 2010. ^ "Bio for Sarah Chang". Pittsburgh Symphony Orchestra. Retrieved October 31, 2010. ^ "Sarah Chang - Brahms, Theofanidis and Franck". Barbican Hall. February 12, 2010. Retrieved October 30, 2010. ^ "Inside the Violin: an interview with Sarah Chang". Asia Pacific Arts. March 19, 2010. Retrieved October 31, 2010. ^ "Music review: Leonard Slatkin and Sarah Chang return to the Hollywood Bowl for Shostakovich [updated]". Los Angeles Times. August 25, 2010. Retrieved October 31, 2010. ^ Paisley, Jamie (Jan 14, 2017). "Violinist Sarah Chang on surviving her crazy world-tour schedule". wkar.org. Retrieved 2018-02-13. ^ Reel, James (1 January 2004). "Interview with Violinist Sarah Chang". Strings Magazine. ^ "EMI Classics UK | Release | Bruch: Violin Concerto No.1 / Brahms: Violin Concerto". EMI Classics. September 2009. Retrieved October 30, 2009. Wikimedia Commons has media related to Sarah Chang. This page was last edited on 4 February 2019, at 04:43 (UTC).